For centuries, the Coast Salish peoples have been one of the most visible political actors in the Environmental Justice Movement of the state of Washington. However, despite their strong advocacy for environmental justice, environmental justice policies continue to dismiss cultural values, tribal sovereignty, and community mapping. 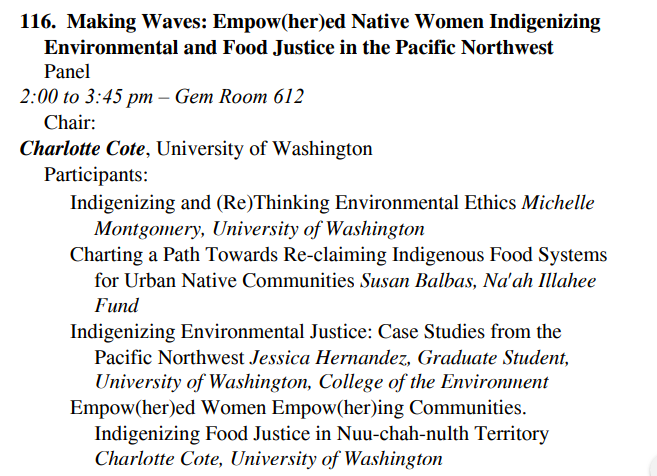 This thesis aims to document several environmental justice cases that have occurred in the Pacific Northwest U.S. (PNW) against or in favor of the Coast Salish peoples since the 1960’s Fish Wars. The environmental justice cases will consist of both environmental victories and injustices that impact and affect the Washington state tribes. For the purposes of this thesis, environmental justice is defined as a theory and framework utilized to describe grassroots movements led by communities of color to protect and advocate for their well-being, livelihoods, resilience and Mother Earth. The environmental justice cases documented in this study will be utilized to develop an environmental justice atlas and website. The environmental justice cases will be coded to determine the indigenous pillars of environmental justice for the Pacific Northwest U.S. The indigenous pillars of environmental justice will identify the important tribal and cultural values for the Coast Salish tribes and nations. These indigenous pillars of environmental justice will allow policy-makers to shift from distributive, procedural and recognition justice by incorporating cultural values, tribal sovereignty, and community mapping. It is important to acknowledge that environmental justice is a complex issue in Indian Country, therefore, there are no simple solutions to address environmental justice provided in this thesis, but rather initial tools to start building, adapting, and applying the environmental justice concept to the specific context of the indigenous experiences in the United States. 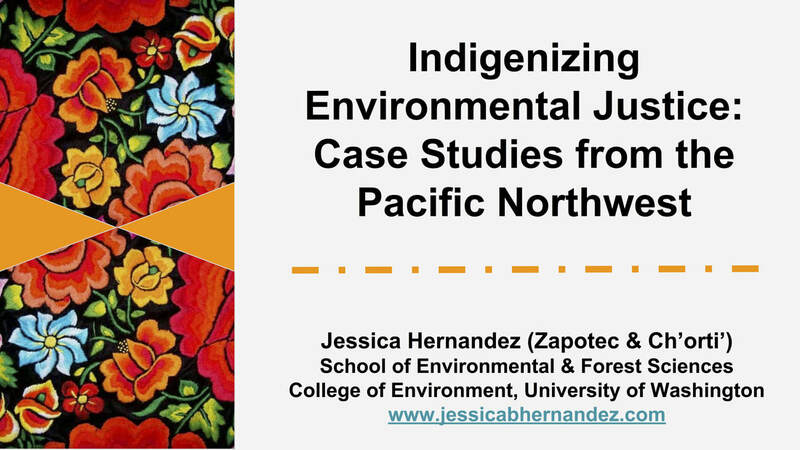 This environmental justice curriculum was developed by Jessica's research assistant, Vanessa Sanchez. Vanessa developed this curriculum for her senior capstone project for the Environmental Science and Resource Management (ESRM) major. She also presented her capstone project at the Doris Duke Conservation Scholars Program in Summer '17. Vanessa is now an educator in Phoenix, Arizona—taking her passion for the environment and teaching inside the classroom setting. The goal of her capstone project was to create classroom materials and tools that facilitate the integration of environmental justice into the K-12 education curriculum for the state of Washington.